It’s been a long time since my last post – since May! I just gave up on it for a little while; blogging is a lot more work than what it looks like. But, I really had to post this because avocado is the best thing EVER. There were all these avocados sitting around ripening faster than I could eat them so I decided to make something. 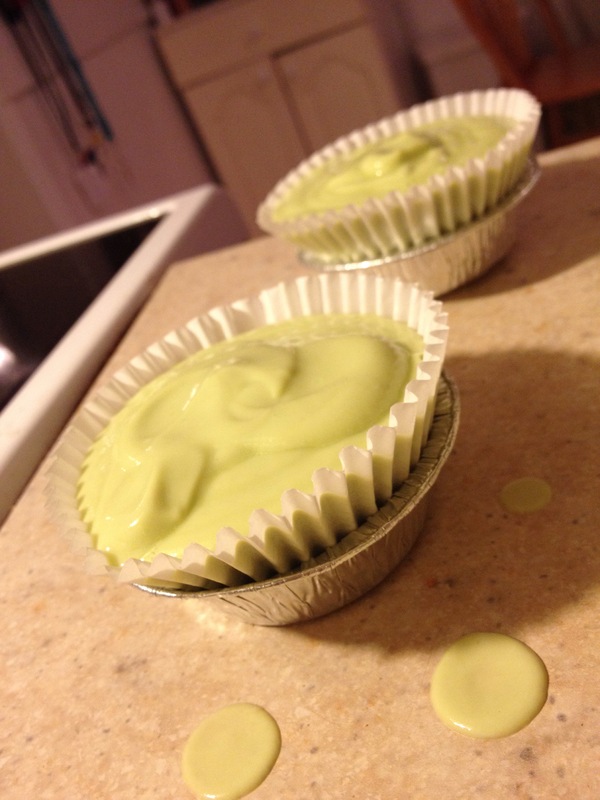 I thought, since avocados are green, I could make key lime pies. A traditional key lime pie contains milk, cream and eggs, but my pies are 100% vegan! The first time I tried this recipe I used lemon juice and the pies turned out just as good. As a warning, they turn out quite sour! If you like them sweeter, feel free to add in your desired amount of sweetener (I only used 3 packets of stevia). This makes a small batch; just big enough for 5 people. 1. In a blender, process the avocado, yogurt, lime zest and vanilla. You can add the sweetener at this stage as well. 2. Sprinkle the agar over the lime juice and mix until combined. 3. Bring the milk to a boil, then take it off the stove. Then, pour the hot milk into the lime-gelatin mixture and whisk until everything is combined. 4. Pour the milk mixture into the blender and pulse one more time to make sure everything is mixed well. 5. Set up 5 muffin cups. Take the graham crackers and crumble them as small as possible. Then, divide the crumbs among the muffin cups evenly. 6. Pour the avocado mixture into the muffin cups over the cookie crumbles. 7. Transfer pies to the fridge to chill for 2-3 hours. And, you’re done! 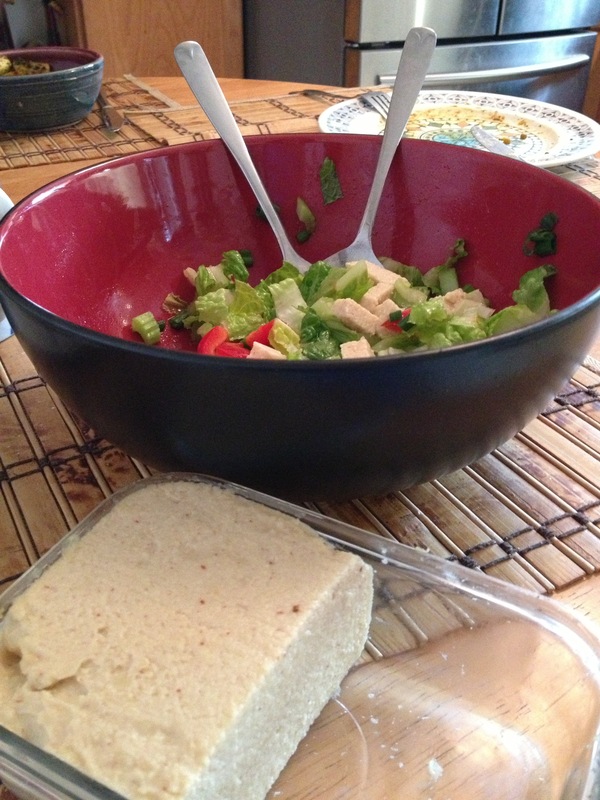 Diet, Desserts and Dogs is just an amazing blog for healthy allergen-free food! 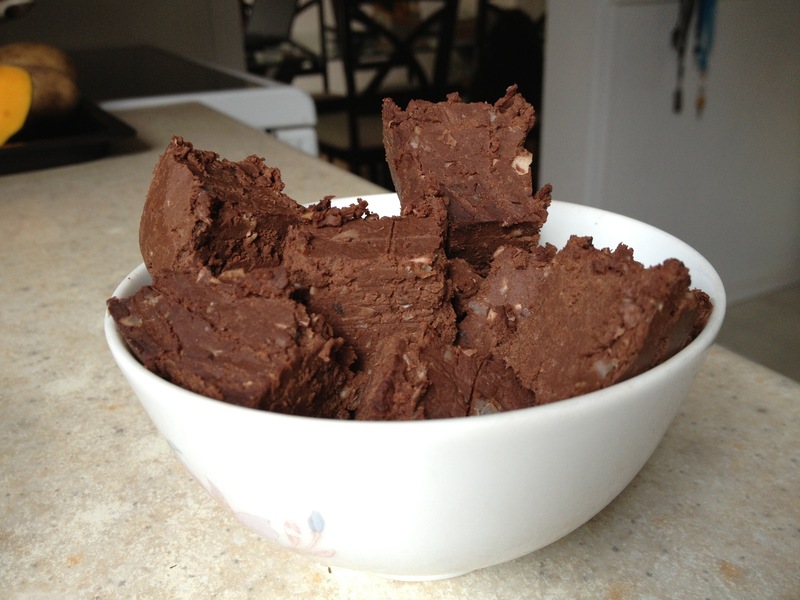 This recipe for fudge is taken from the blog as well. My version used black-eyed peas and all cocoa powder while her recipe used black beans to give the fudge a darker colour. 1. Line a loaf pan with wax paper and set it aside. 2. In a food processor, combine all ingredients except for the unsweetened chocolate. 3. Then, add in the chocolate and blend again. For me, the mixture became too thick to blend, so I did this step by hand. 4. Put the mixture into the loaf pan and press down to take out any air bubbles. 5. Cover the pan and let it set in the fridge for about 2 hours or overnight. After it has set it can be sliced into squares and should be continued to be stored in the fridge until consumed. I made a huge salad yesterday and I wanted to add something more to it. 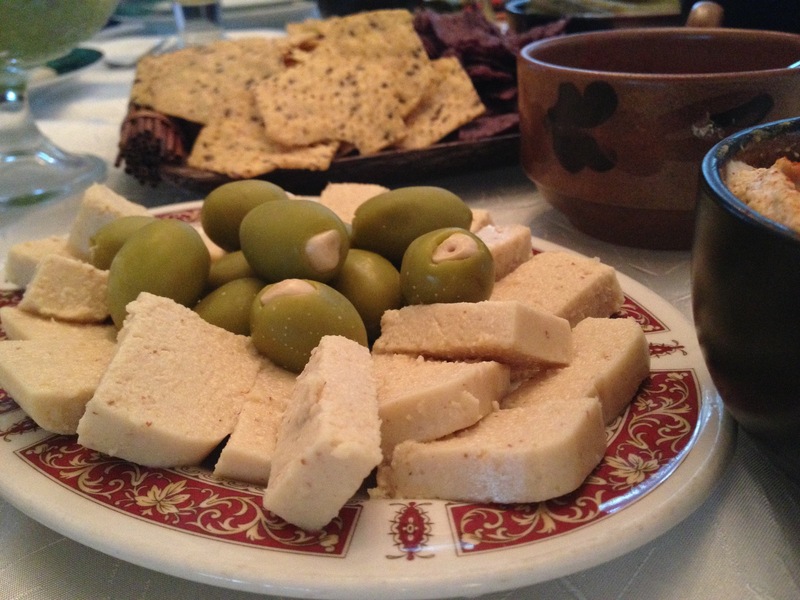 So, I found this vegan cheese recipe from Diet, Desserts and Dogs. Some of the ingredients were adapted as I didn’t have everything on hand. I think that any sort of spice can be added to the cheese to make different flavors. It doesn’t really taste like swiss cheese, more like a savory jello-type food, but it’s good either way! 1. Combine water and agar powder in a saucepan and bring to a boil. 2. Combine the rest of the ingredients in a blender and add the agar mixture as well. 3. After blending, pour the mixture into a container and let it cool uncovered in the fridge. After it has set (about 2 hours), it can be covered. I’ve often seen rutabagas and fennel bulbs at the grocery store, but i’ve never had the courage to buy them. Ever since i’ve developed food intolerances i’ve been trying out new foods in attempts to vary my diet. These recipes are relatively simply to put together and not time-consuming. What’s more is that they taste great as a snack or as a side dish for lunch or dinner. 2. Grind equal parts rosemary, thyme, and dried parsley with 2 pinches of salt in a coffee grinder to make sure they are mixed well. Drizzle with oil and mix everything up so that everything is coated (I did this with my hands). 4. Bake for about 1 hour at 450 F or until a fork can be easily pierced through the rutabaga. 1. 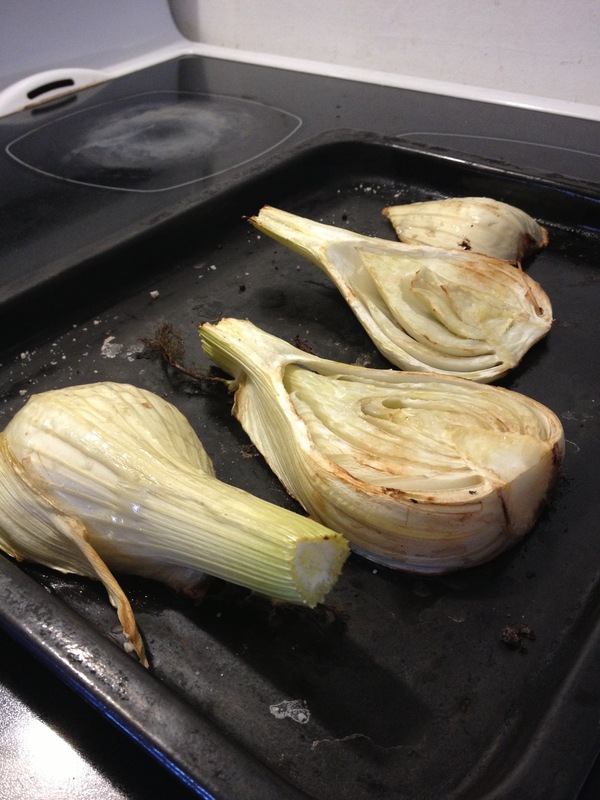 Cut the fennel bulb lengthwise. 2. 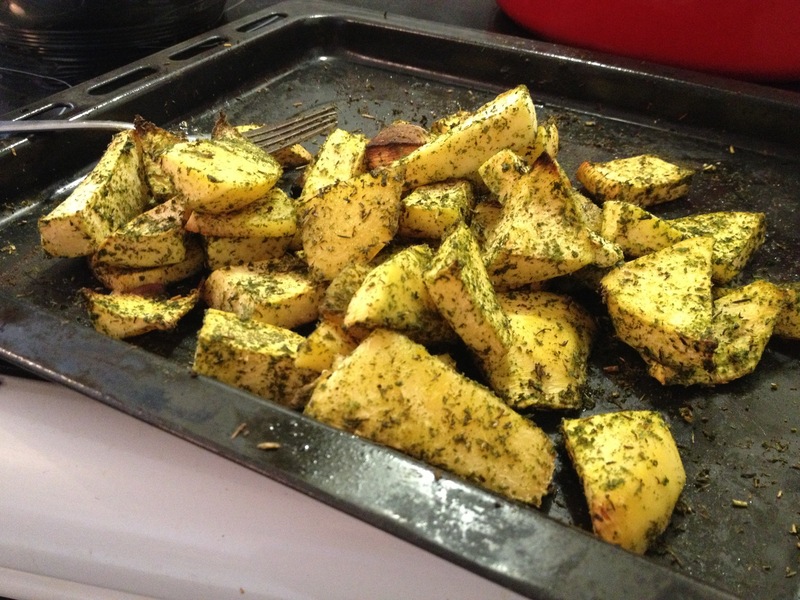 Place on a baking tray, sprinkle with salt and drizzle with olive oil. 3. Bake for about 30-40 minutes at 400 F, or until tender. I had this amazing mango custard a while back and I wanted to reproduce it. Unfortunately I didn’t have any mango at home so I used honeydew melon instead. 1. Blend the melon until it is liquid. Set it aside. 2. Combine the coconut milk and agar powder in a saucepan and bring to a boil on high heat stirring constantly. Reduce heat to medium-low and stir occasionally until the agar has dissolved. 3. Take the milk off the heat and stir in the pureed melon and sweetener. 4. Pour equal parts of the finished mixture into small sized ramekins (this recipe used 4). 5. 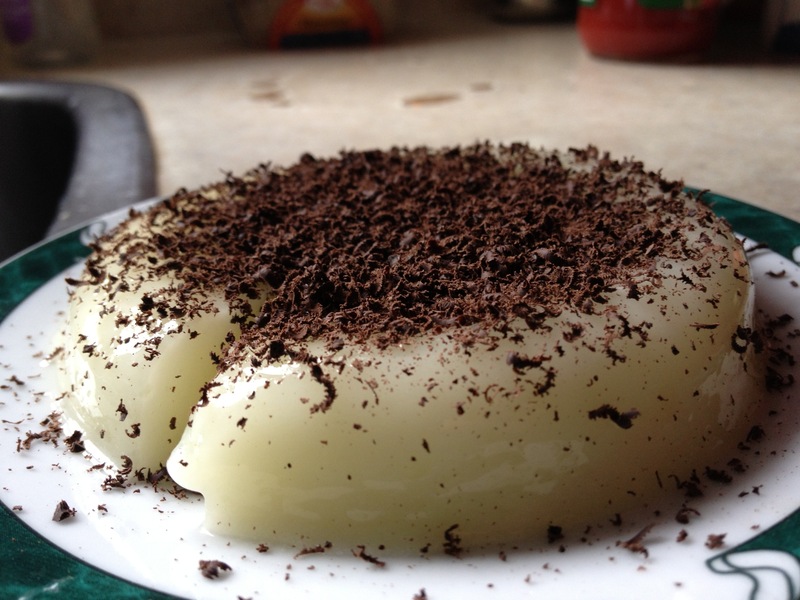 Sprinkle shaved chocolate over each custard to garnish. 6. Chill in the fridge about 2 hours, or until set. I normally eat butternut squash roasted straight out of the oven and sometimes I add some cinnamon to it as well. But, this time I wanted something different. So, I stuffed mushrooms with roasted squash and cooked it some more for lunch. 1. First, cook your squash. I cooked mine for 1 hour at 400 F, but temperatures can vary among ovens. 2. Separate the stems from the mushroom caps and reserve them. They will be mixed into the stuffing. 3. Puree the cooked squash (I did this by hand) and add in the chopped onion. Chop the mushroom stems into small pieces and add those in as well. 4. Season the mixture with your preferred spice blend. I added salt, dried parsley, dried onion and garlic, dried dill weed and pinch of paprika. 5. Take about a spoonful of the mixture and stuff it into each of the mushroom caps. 6. 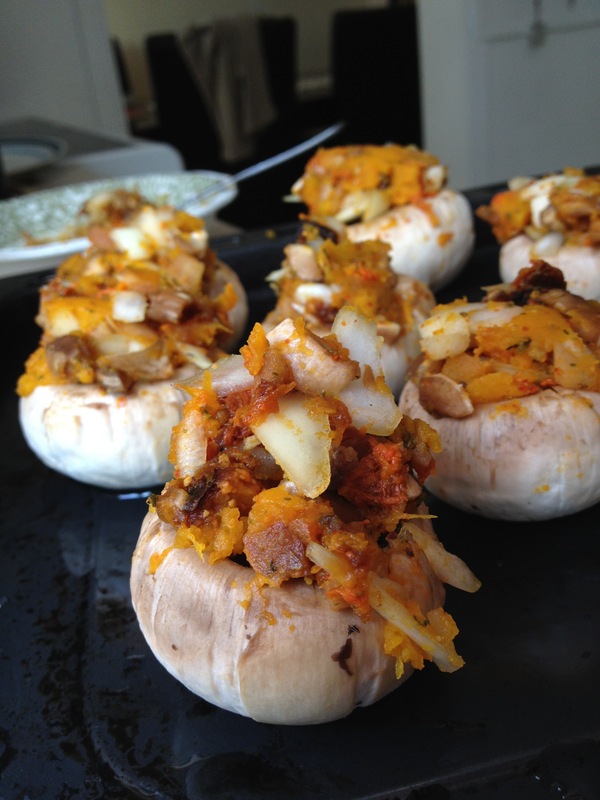 Place the stuffed mushrooms on a baking tray and drizzle them with a bit of olive oil. Place the tray in the oven and cook for 10-15 minutes at 350 F.
I would never have guessed that I could make “cream cheese” out of cashews. And, what’s even better is that cashews don’t contain the animal fat that cream cheese does. I made this cheesecake using pineapple, but any fruit will work in the same quantity (1/2 cup). There is a bit of planning involved here as the cashews should be soaked around 2-4 hours and the cake sets in the fridge in about 1.5 to 2 hours. 1. Process the pecans and dates until the pecans are finely crushed. 2. 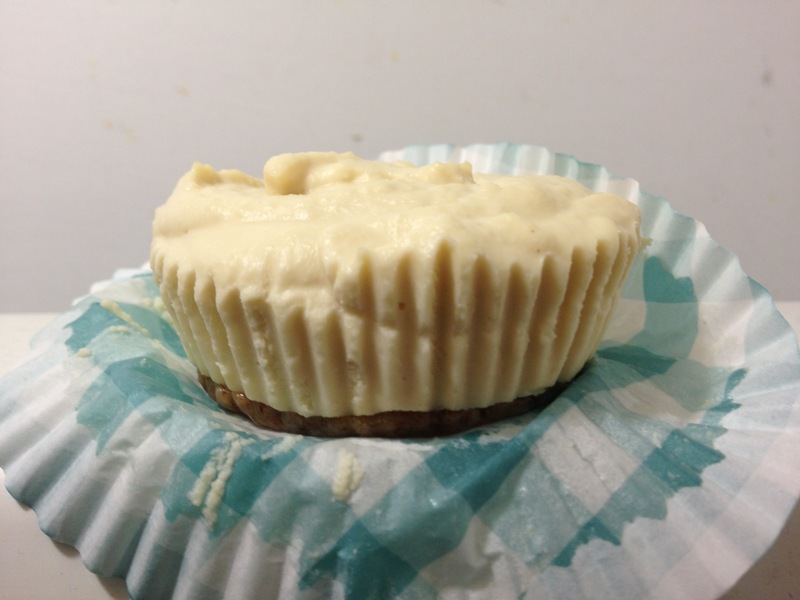 Divide this mixture evenly among 5 cupcake liners and press down to form the crust. 1. Combine all ingredients (except for the fruit) in a blender until creamy. I used a magic bullet and it worked okay. 2. Add the fruit and blend. If using frozen fruit, make sure it is soft enough that it will combine with the rest of the filling. 3. 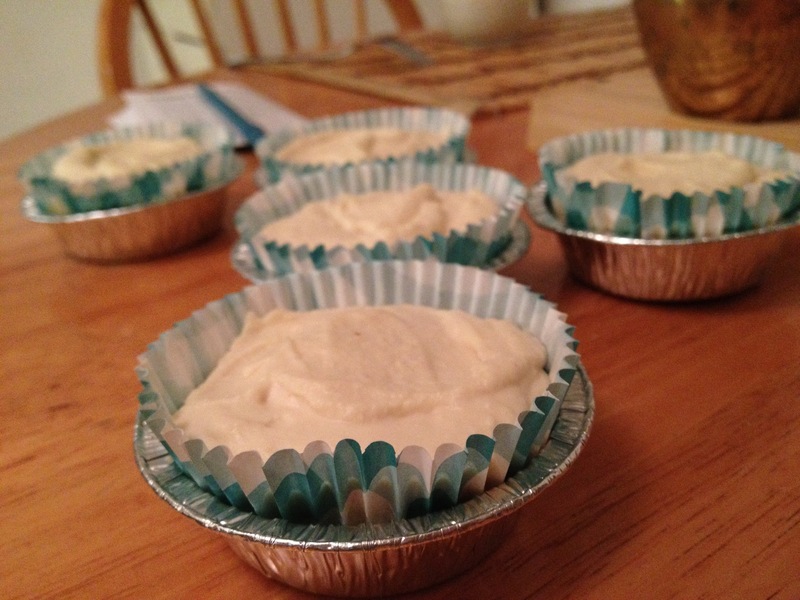 Pour the mixture on top of the crusts of the cupcakes. Even the tops out with a spatula or knife. 4. Refrigerate to solidify for about 2 hours. They can also be frozen to speed up the process, but I didn’t try that.